The April 25 Bridge stands right on the River Tagus, in the metropolitan area of ​​Lisbon, Portugal. 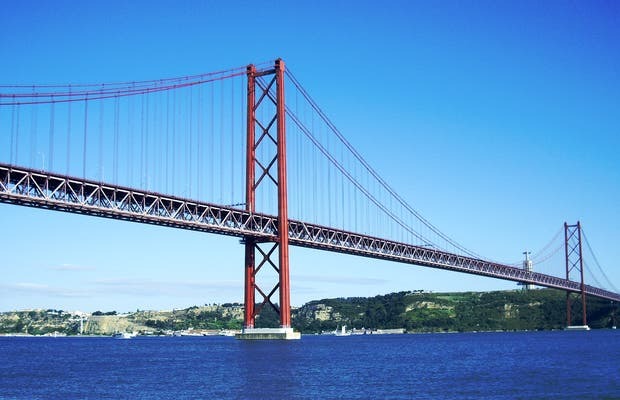 Officially name at the time as Salazar Bridge, it was built by Salazar in 1960, and was designated its current name after the Revolution of April 25, 1974, which restored democracy in all of Portugal. It has an imposing aspect, with a steel construction that extends almost 2 kilometers. The bottom was recently renovated to house train tracks and such. You can also cross the river by boat and on the other side stands the statue of Christ the King. Beautiful landscape and amazing restaurants. With view to the bridge and the river nearby: Docas de Santo Amaro.